Though not an exact quote, this is a lesson I distinctly remember from Steve Job’s official biography by Walter Isaacson. If you let the best people work together, learn from each other, and create something together, innovation happens. This is why Apple is successful. Team WWW was created by my restless and crazy mind because like any young person who is confused but who wants more out of her life, I need a lot of guidance and these ladies are serving that purpose. Team WWW is a company for twenty-something women and focuses on three things: a) Your Ambition & Dreams, b) Your Beauty & Wellness, c) How You Feel About Yourself. Specific offerings are: career coaching and mapping, skin care products and beauty treatments, and personal development. She is NOT JUST the COO of Facebook or Mark Zuckerberg’s second-in-command. Her book, Lean In, says it all: women are underrepresented in the workplace, because we think we deserve less. But we deserve to be heard, understood, and recognized. Sheryl gave women a clearer, louder voice, instead of barely-heard whispers. She did all this, while running a company, writing a book, and choosing not to neglect her own family. Key Message: DON’T WHISPER, SAY IT. DON’T LEAN BACK, LEAN IN. She is the one who inspired me to share my personal insights in a blog and to choose to share positive, uplifting experiences instead of posting non-helpful stuff (like gossip or abrasive rants). I believe her influence doesn’t just come from being a model, but it also comes from her personal writing. Her humility and sense of humor make you feel you can relate to her. Hence, she is perfect for the role of Vice President: she is that warm, positive glue sticking the parts together and making sure they work perfectly. She loves food, dishes out beauty and shopping tips, talks about her funny stories with her husband and her friends, and shares about her shortcomings and clumsy moments, too. That way, anyone can just talk to her and approach her. Key Message: CHOOSE TO BE HAPPY. CHOOSE TO LAUGH AT YOURSELF. CHOOSE TO ENJOY LIFE. I just adore Katy Perry (read my previous post to know why). She has a way of saying things that is rather irreverent and scandalous, but it’s always playful, relevant, and with purpose. All her songs may be catchy and witty, BUT THEY SEND POWERFUL MESSAGES. That is what is needed in a PR Officer: being able to say things people will NEVER forget, extending the influence of the company, and always coming up with something WICKEDLY exciting. Key message: WHY BE POLITE WHEN YOU CAN ROAR? Dr. Teo is my personal career idol. She was a creative person who was forced to go to medical school by her father. Hence, she chose to go into dermatology because she liked to dress up and to make people look smashing. Then she found her partner-in-life by way of a plastic surgeon in Singapore. They maintained a long-distance relationship for a while, got married, had kids, and now they have homes AND clinics in both Manila and Singapore, shuttling between the two and owning beauty empires in both. I can personally relate to her story and I really, really look up to her, hence I created a special position just for her. Key Message: DON’T BELITTLE BEAUTY. LOOKING GOOD MEANS YOU TAKE GOOD CARE OF YOURSELF. Elle Woods made the world THINK TWICE ABOUT BLONDES. Being smart and loving hot pink are not mutually exclusive. Elle Woods offers an alternative role model to girls who are often stereotyped as too pretty to care about being serious. Elle Woods says that being bakla and kikay do not depreciate your potential. You can enjoy all these kaartehan but also be passionate, goal-oriented, and FULL OF PURPOSE AT THE SAME TIME. Hence, she holds the position of The Stereotype-Breaker. Key Message: THE WORLD IS FULL OF STEREOTYPES WE NEED TO TRAMPLE ON – IN HIGH HEELS, OF COURSE. There you go! 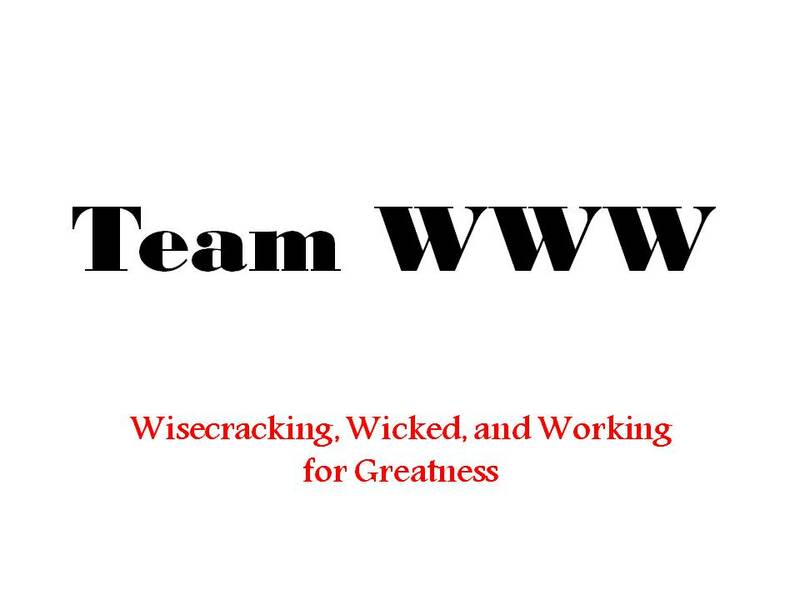 You’ve met The Board of Directors of Team WWW. Wisecracking, Wicked, and Working for Greatness. Tell me, are you one of us? We are looking for YOU. Come over here and make your presence felt. Sent you an email! Sorry for the late response!